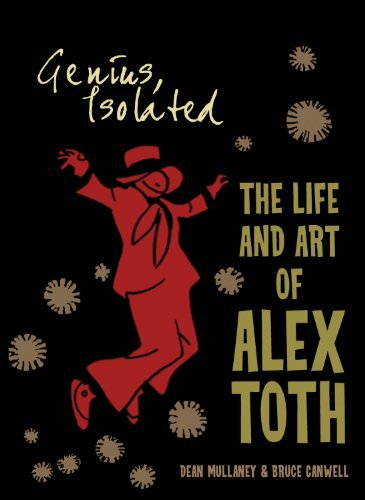 This is book 1 of 3 that covers the life and career of American cartoonist Alex Toth who was active in 1940s to 80s. The publisher IDW has once again come up with a stunning artist biography book. This book is huge. It's a bit larger than A4 size and it's 328 pages thick. The paper is non-gloss white. Layout and editing is wonderful. This first book collects his early works until the early 1960s. There are his life stories, his early days at DC, lots of different genre comics reprinted in large format, stuff like Zorro, romance comics, photos, others. It's a nice read that provides some interesting context on the comics industry at that time. It's worth checking out for comics and Alex Toth fans. More reviews on Amazon. Created by the Eisner Award-winning team of Dean Mullaney and Bruce Canwell who produced the ground-breaking Scorchy Smith and the Art of Noel Sickles-Genius, Isolated is a lavishly illustrated book that includes the first biography of this giant figure. The book has been compiled with complete access to the family archives, and with the full cooperation of Toth''s children. To flesh out the complete story of his life and art, Mullaney and Canwell have spent more than two years conducting wide-ranging interviews with Toth''s peers, friends, and family members. This is the beginning of a comics biography everyone will be talking about for years to come. In addition to art and photographs from the family, Toth fans and friends throughout the world have loaned original artwork reproduced in the entire series. Included are many examples of Toth''s art, from twenty-one complete stories to rare pages, as well as-incredibly-a previously unknown, unfinished, and unpublished penciled story from the 1950s! The tome covers his earliest stories at DC in the 1940s, his defining work at Standard, his incomparable Zorro comics in the 1950s, and a special section collects-for the first time-the Jon Fury pages that Toth produced while in the army, a section that alone is worth the price of admission. Genius, Isolated details Toth''s life story and work through the early 1960s, when he began his sensational move into animated cartoons. The second book in the series, Genius, Illustrated (US | CA | UK | DE | FR | IT | ES | JP | CN | Book Depostory), continues the story. Gorgeous looking. Looks really in depth.